Discover how to perform any routine action in one click! Stop typing the same text over and over again! Now you don't need to go through numerous menus to find the necessary program or web page. With this new generation hotkey manager you can leave your mouse alone and configure hotkeys for all of your actions - just like real pro's do. Comfort Keys will help you to: + Launch the necessary programs and open web pages by pressing a single hotkey. + Insert predefined texts (email templates, signatures, passwords, greetings, phone numbers, addresses, etc.) using hotkeys or the built-in template manager. + Change the language and case of the typed text. + Control the sound volume in a quick and convenient manner. + Record key press sequences and play them back as many times as you need. + Block some keys or simulate the press of a specific key when another one is pressed. + And much more. We made sure you always have a hotkey guide at hand by integrating a fully functional on-screen keyboard showing all the available hotkeys. We also wanted to make your work simpler and more efficient by integrating several useful tools into Comfort Keys: + A clipboard manager. + Text and graphic templates manager. + An enhanced application switching window. + A current language flag which is always located next to the text cursor and helps determine the currently used language. + A history window for the previously launched applications with an ability to quick-launch them again. Changes: New design and new icons. New styles have been added: Windows 10, Colored, Android. The window for selecting the type of keyboard has been improved. 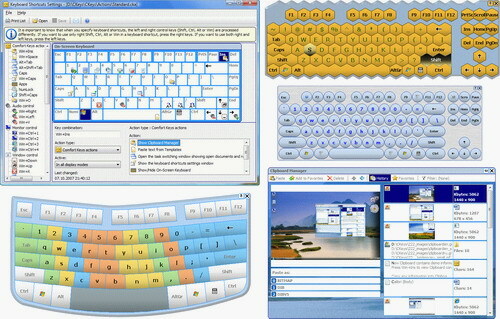 Almost all on-screen keyboards have been improved. Improved support of High DPI Displays. Lots of other fixes and improvements. Comfort Software Group gladly announces the release of Comfort Keys Pro 7.0, a successor to the popular hotkey management tool.